The Colman Automotive Building entered the National Parks Service’s National Register of Historic Places very recently — in 2013. It is not currently a City of Seattle Landmark, but the national listing is good enough for it to make our Landmarks Profile roundup. May 15, 1945. Image: WA State Archives. On Labor Day weekend of 1929, 300 motorcyclists and their families roared into the sleepy resort town of Long Beach, WA for a motorcycle rally known then as a Gypsy Tour. Aside from the three days of two-wheeled camaraderie that ensued, one rider raced ahead of the rest. His name was Marion Diederiks, an unknown motorcycle messenger from Portland who became “grand champion” after winning 8 out of 12 races over the weekend. His victories included various pursuit and get-away races, the two-mile open, and a broad jump. Although a promising start of a career in racing, he curiously never won any other speed races like these hereafter. Instead he later found his true calling in a different form of racing known as the hill climb — a race to the top of rough hills that were so steep they were practically vertical. Marion’s career negotiating these hills spanned two decades and culminated in the establishment of his own Harley Davidson dealership on a most unique hill — our very own Capitol Hill. A prime piece of Pike/Pine’s commercial past and present has a new owner. A company associated with the Keeler Investment Group, an investor in “Pacific Northwest-based, early stage, private equity and real estate opportunities,” for $14 million, according to King County records. The Landmarks Preservation Board voted Wednesday night to approve one auto row era building on Broadway nominated for landmark status and deny its next door neighbor. Both are properties owned by Seattle Central and are being lined up for affordable housing development by the school. The board will now consider 1519 Broadway, the former Eldridge Tire Company, for designation in March. The consideration process for 1515 Broadway, today home to burger joint Freddy Jr.’s, ended with the board’s vote. The other property, home to the burger joint today and, long ago, the Stewart Warner service station, didn’t have the qualities it takes to qualify the next part of the designation process. 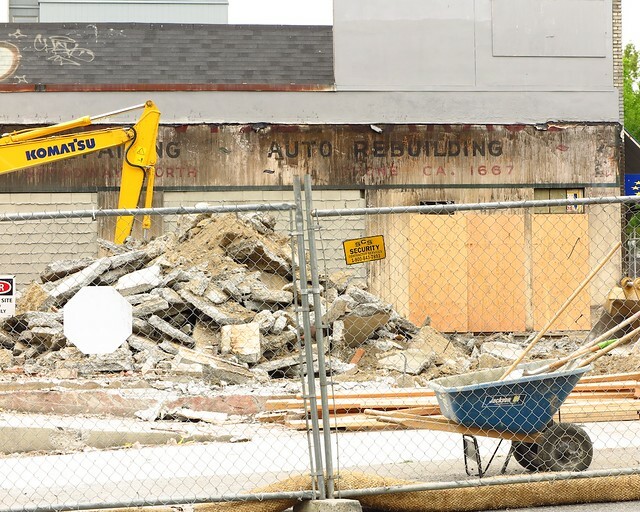 As it seeks a partner in its plans for affordable housing, Seattle Central will take the auto row history of one of the two Broadway properties it is pushing forward toward redevelopment in front of the Seattle Landmarks Preservation Board next week. The board will weigh just what architectural features if any should be protected in the one-time Stewart Warner service station and its neighbor the old Eldridge Tire building in the 1500 block of Broadway between Pine and Pike. Today, the structures are home to a burger joint, a taco joint, and a hair stylist. The board will consider the buildings for nomination Wednesday afternoon. Capitol Hill’s auto row was created by entrepreneurs launching start-ups, of sorts. One modern vestige of the era has made a home for a set of entrepreneurs to make their mark in history with one of the neighborhood’s new economic lifebloods: coffee beans. Bean Box, a “gourmet coffee” subscription and gift service, has been growing its business out of the recreated auto garage next to Bill’s off Broadway. A former Capitol Hill chocolate factory — in an auto row era building with an, um, nutty past — will provide “character inspiration” for what could be the first passive house certified mixed-use development in Seattle. The project faces its first design review Wednesday night. CHS reported on the uber-green six-story, 55-unit project above 2,400 square feet of retail space, and no underground parking late last month as frequent Capitol Hill developer Maria Barrientos teamed up with Cascade Built and architects Weber Thompson to transform the corner of 13th and Pike still owned by Fran’s Chocolates which moved its operations to Georgetown in 2014. Just down the street from the Bullitt Center, the world’s first living building, the project will aspire to the standards set by Passive House Institute US. Among the many requirements, passive buildings are required to be extremely airtight and insulated to minimize energy use. UPDATE: The project is, indeed, planned to have 26 units of underground parking. It’s nowhere as interesting as last month’s news that big ol’ Redhook is building a brewpub and “small-batch” brewery inside the Pike Motorworks development but it is a reminder of the property’s auto row past and the environmental reviews required to make the Capitol Hill block comply with environmental health statutes. The Department of Ecology is taking public comment on the proposed removal of the “environmental covenant” on the E Pike property as a last step of certifying that restrictions can be lifted after a petroleum, lead and cadmium clean-up process.